You need to get a great contrast between light and dark colors to make your engagement ring look memorable. 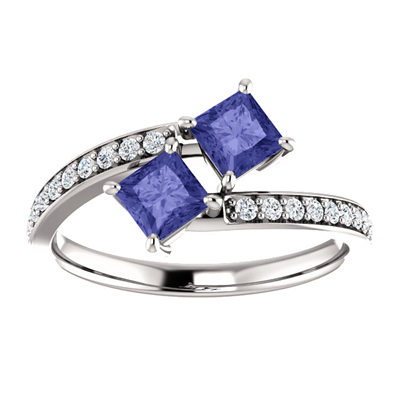 This "Only Us" princess cut ring will do just that as the two 4mm tanzanite stones and the 19 cubic zirconia stones at 0.19 carats fit in well with the light sterling silver body. We guarantee our "Only Us" Pricness Cut Tanzanite and CZ 2 Stone Engagement Ring in Sterling Silver to be high quality, authentic jewelry, as described above.